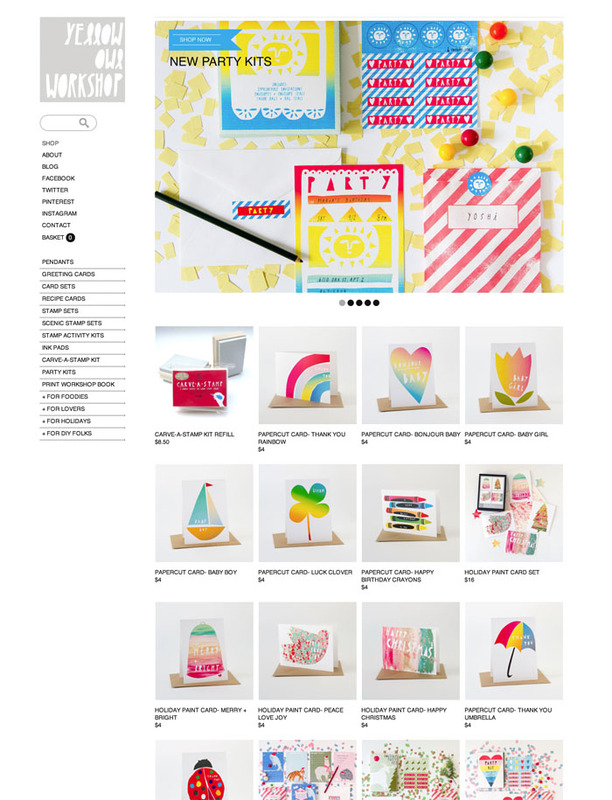 View examples of how designers, fashionistas, jewellery makers, illustrators, photographers, fashion retailers and creative entrepreneurs are using SupaDupa's store templates to take their work and products to the world! J.won is a young and exciting knitwear brand based in London. Her brand aims to combine varying design principles to bring unique and exciting identity for its customers. The concept is to empower women but remain sophisticated, practical yet chic, unique but with a wide appeal. Combining these attributes bring the feeling of exclusivity and power to women who can wear it according to their own fashion preferences. Jiwon, the head designer, believes that knitwear should not just be about comfort but portray style and clear identity for those who wear it. She seeks to bring these themes out by combining colour, collaboration of various techniques and experimentation of combining new and old to ensure that the collection is not just 'trendy,' but bring a classical feel to knitwear. 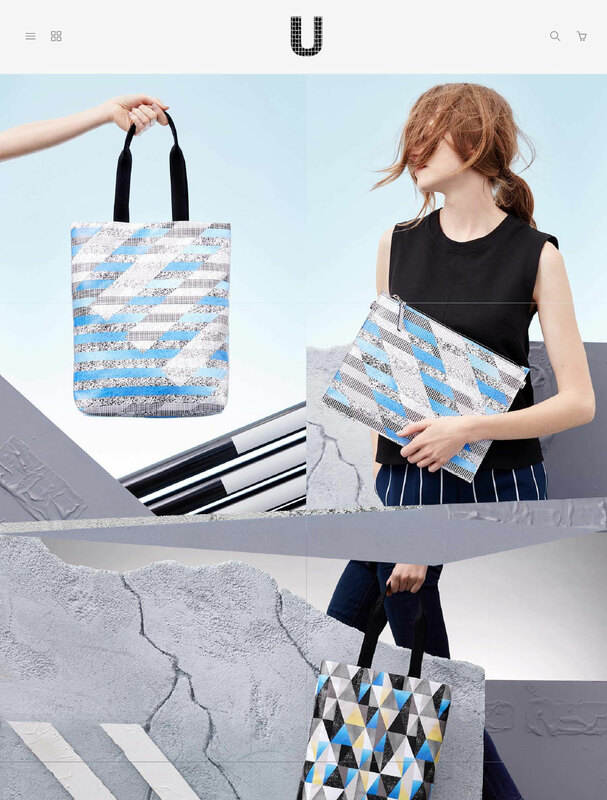 Mury’s debut handbags collection draws inspiration from the urban environment, its colours, shapes and textures, blending luxurious, modern materials and cutting-edge design into a collection of seductive must-have pieces. 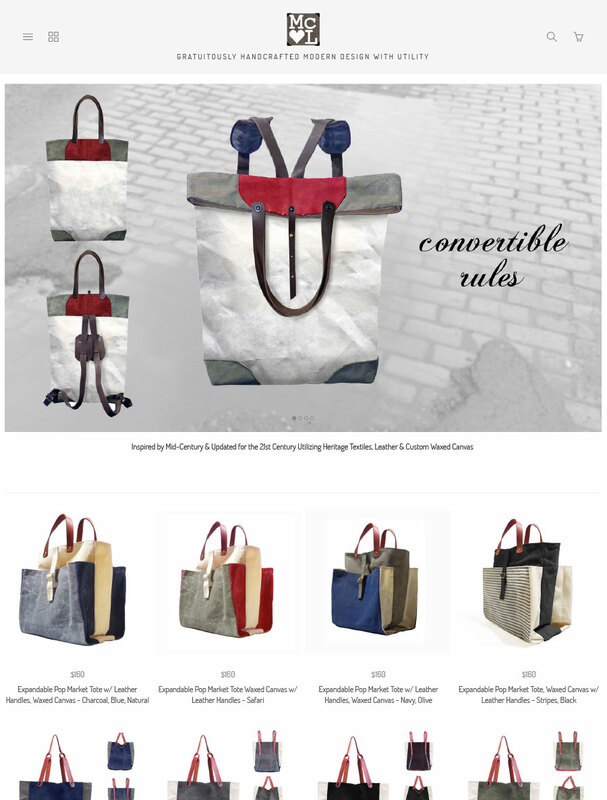 Designed and engineered for the busy contemporary woman who travels the city and beyond, Mury’s collection achieves a new, distinctive style using animal-free, sustainable materials and simple, functional details. Founded by Anja Mury in London in 2013, Mury combines Anja’s technical know-how acquired over more than a decade of working for luxury fashion designers with her passion for sustainability, experimentation and screen printing. Jewellery designer Merle O'Grady trained in Fashion Design in her native Ireland before relocating to her current home of London in 2004. After specialising in Accessory Design at the world-renowned Cordwainers College, her journey into jewellery design began upon stumbling across a bucket of 18th Century chandelier crystal by chance in a dark corner of an architectural salvage yard. Merle's edgy yet feminine designs feature regularly in numerous publications including Vogue, Elle, Harper's Bazaar, InStyle and Grazia and she is very grateful to count Beyonce, Kylie, Cheryl Cole, Florence Welch, Rihanna, Pixie Lott and Kelly Rowland amongst the fans of her range. Merle uses a striking custom template to showcase her bold designs. Their story begins here, deep within the walls of a well habituated establishment with only a coffee machine between them. Yuka meet Tristan. Tristan meet Yuka. Students of creative disciplines who love to talk - only not in the same language. Good thing that never dampened these creative flames - NEVER let a language barrier get in the way of a baby brilliant idea, EVER! 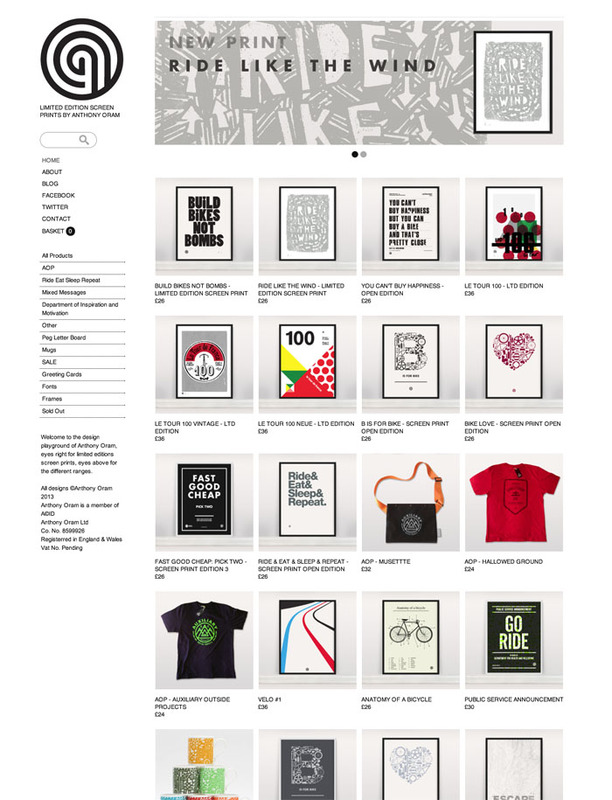 A simple, clean template design has been chosen by this design duo for their online store. Co-Founder and Creative Director of Hold design agency based in Brighton, England. When not meeting the latest deadline, or flying down a hill on his bike, Anthony likes to play with ideas. An obsession with type led to designing posters, which have been sitting on his computer gathering dust. Until now that is. He has finally decided to put them to good use, so has created this online store as an outlet for his overactive mind. By opting for a clean custom template, Anthony's designs dominate the page - just as they should! CooKoo is a boutique based in Milan offering a curated selection of classically designed garments and accessories. 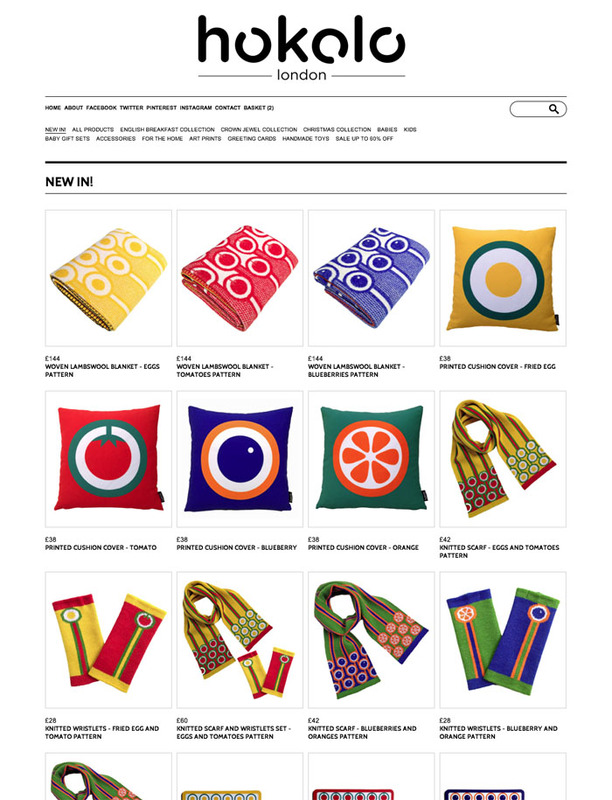 Their ecommerce template design confidently presents CooKoo's high-end designer product. Its philosophy embraces the notion that one's outer appearance and therefore what you wear is an extension of one's inner being and not merely a means to protect and shelter from the elements. When we feel vulnerable and in need of comfort we wear things that console our hearts and the reverse is also true. 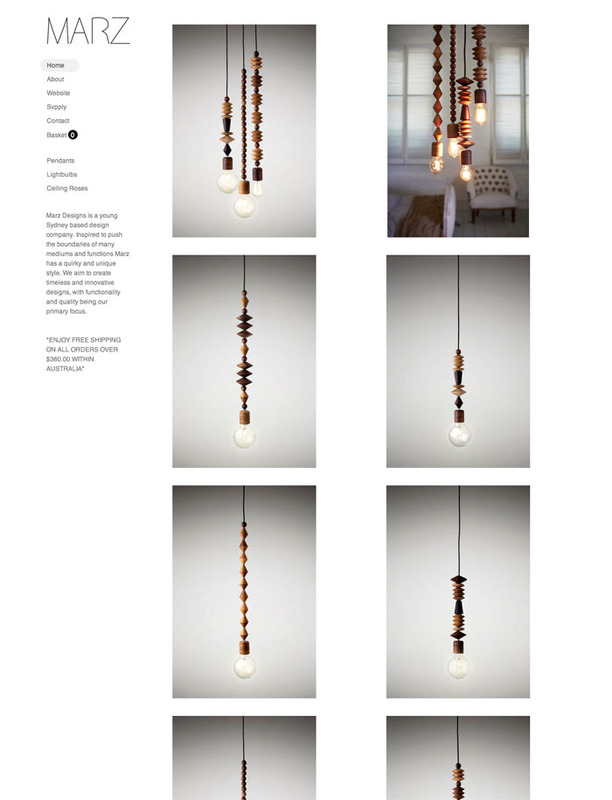 Established in 2010, Studio Henry Wilson is an Australian design and manufacturing company. Though multidisciplinary - the studio is currently focussing on locally produced furniture and lighting. 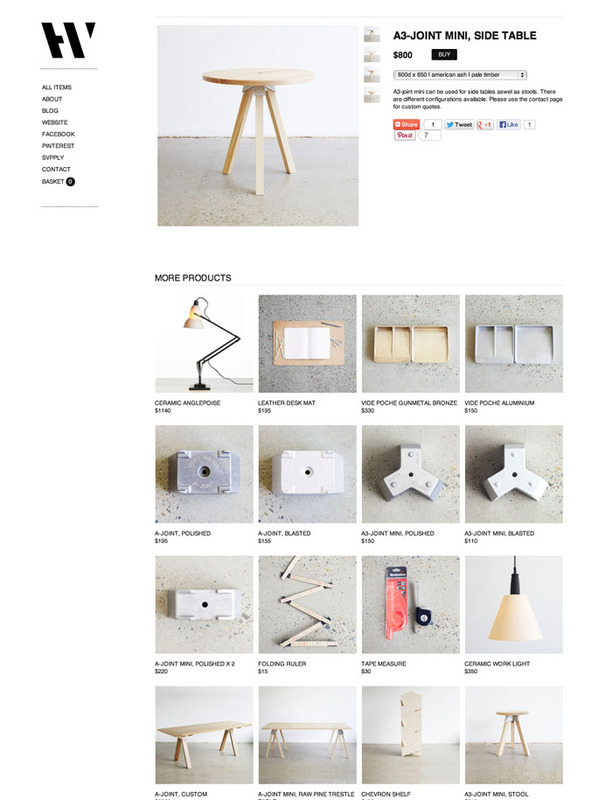 The clean, minimalist custom template of their online store, beautifully supports their industrial designs. Many items are available as self-build components or fully resolved ‘in-house’ pieces. The collection continues to grow organically - committed to honestly resolved concepts with a focus on longevity. Digby Jackson London Is An East London Brand With An International Appeal Designing High End Street Wear For Men And Women. 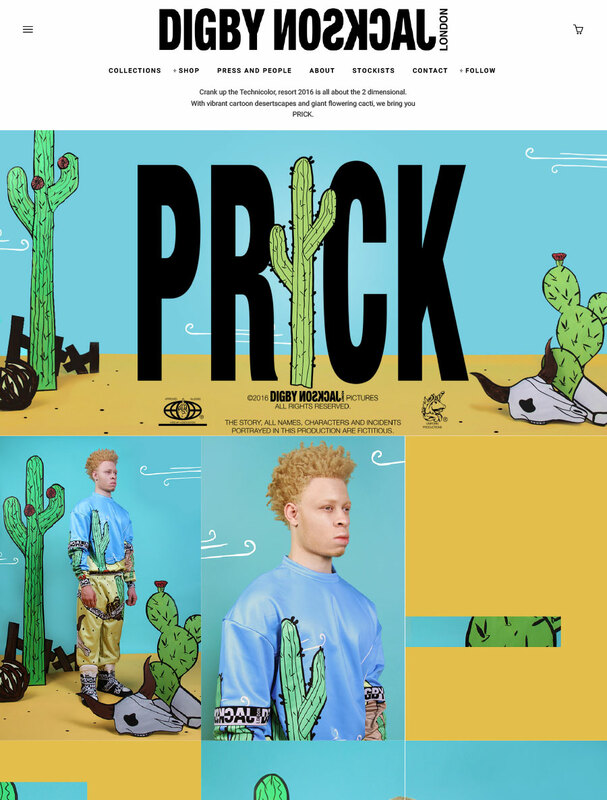 Cut It Open And Fun Runs Right Through The Middle – With Ambitious, Experimental Tongue In Cheek Prints Digby Jackson London Is Recognised And Loved For Pushing The Boundaries Of Print Design Leaving Its Customer Excited And Wanting More. A Relaxed Laid Back Attitude Is Reflected In Print Often Drawing On A Childhood Love Of Film And Superheroes. Easy Unisex Styles Are Offered Alongside Feature Pieces For Men And Women Resulting In Effortlessly Cool Wearable Fun. Christine Schmidt's art career began in primary school when she won a bike at the local grocer's coloring contest. This bike was red and had ten whole speeds! After a youth spent on the plains of Kansas City and art school in Washington D.C., she and her loverboy, Evan, moved west to a little place perched atop windy Bernal Hill in San Francisco. 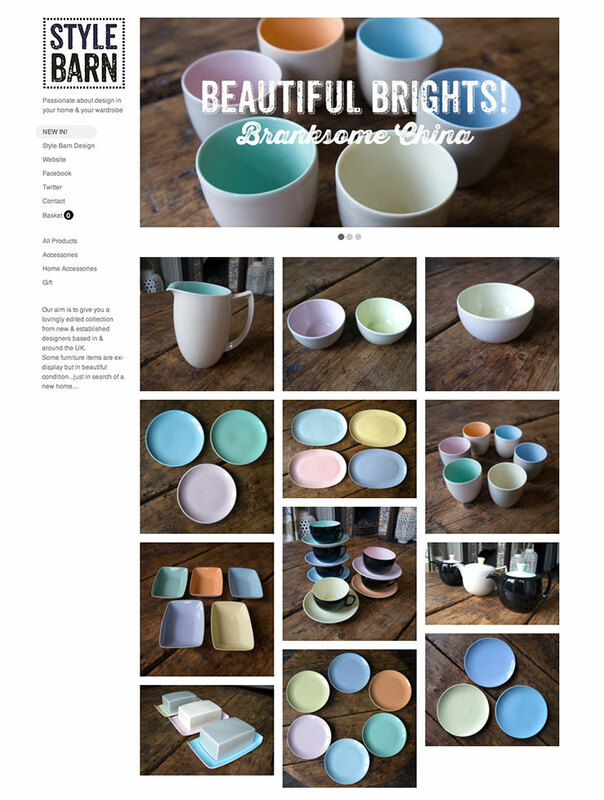 Christine's bright, fun designs and contemporary branding stand out beautifully on her clean, simple custom template. 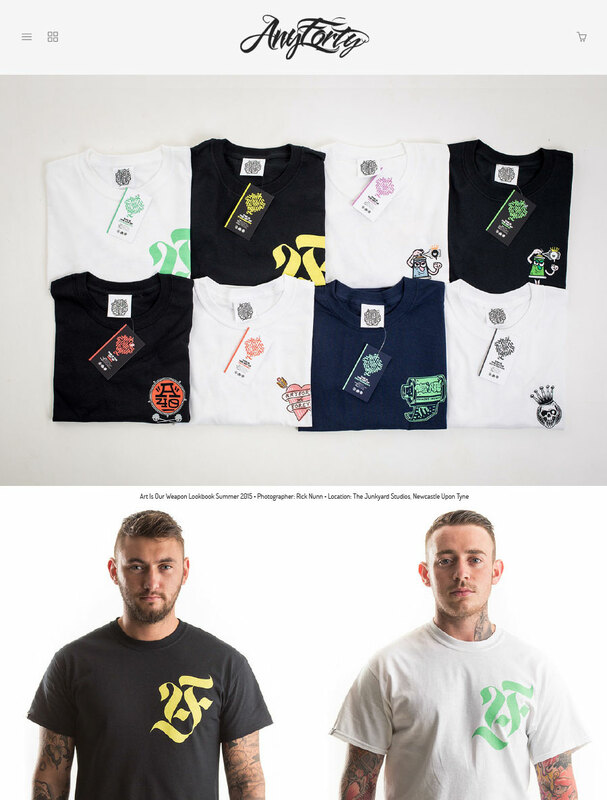 AnyForty is hitting the UK streetwear scene with a tin of Dulux to the dome, steadily attacking the industry with a range of illustrated artist collaboration products falling under the "Versus" umbrella. Dropping product shaped bombs, everything ranging from tee's to crewnecks, and wallets to keyrings. On the banners of AnyForty's online store are the bold illustrations featured in their urban designs. 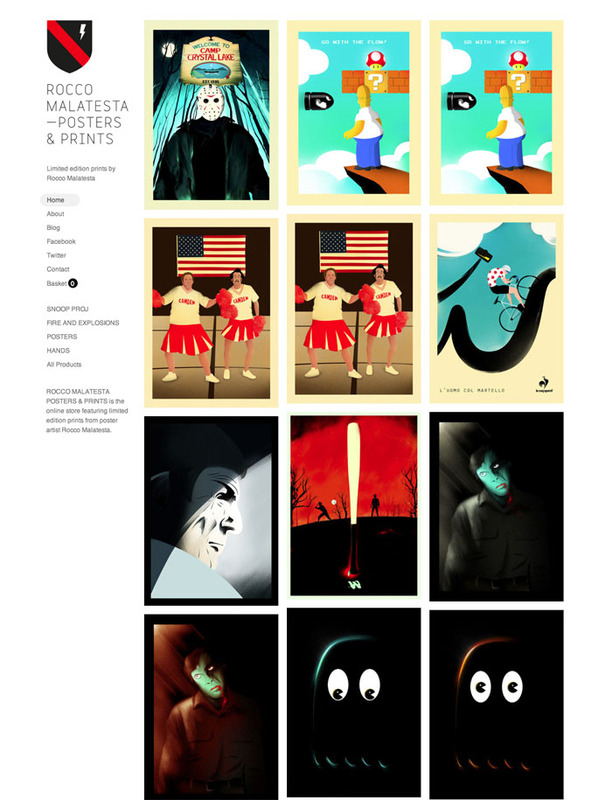 Freelance Graphic Designer and Illustrator based in Berlin. Rocco uses subject matter based in film which expresses itself in Warhol-esque boldness. Rocco takes full advantage of this clean custom theme to showcase his bold, bright designs. 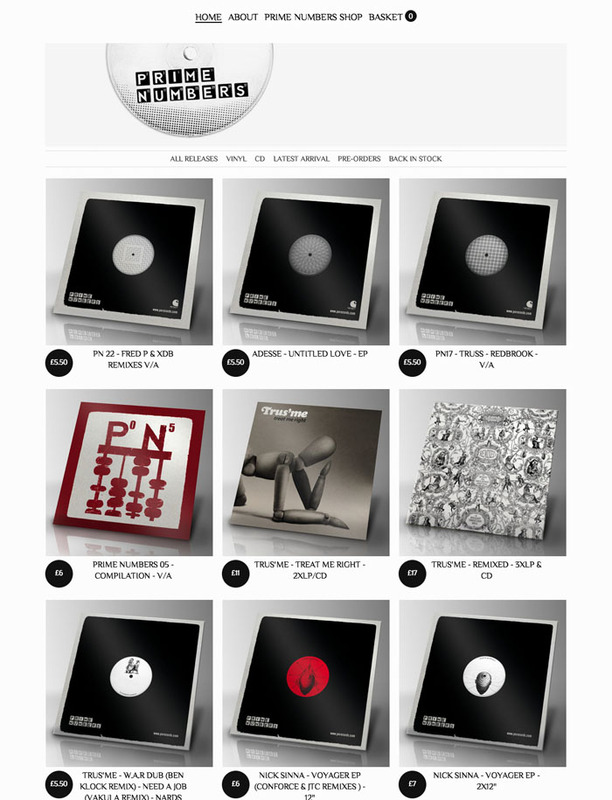 Prime Numbers is a record label created by Trus'me, which apart from his own work, will release records by well known techno and house producers amongst other various genres. This clean, contemporary custom template is used to draw attention to the vinyl covers. Intrigued by the people and landscapes of Savannah and coastal Georgia, Katherine Sandoz paints daily in her studio in Vernonburg. Her work is fuelled by her romance with the act of painting and inspired by her surroundings and the rich history and tradition of the Deep South. By creating from these subjects, she hopes to preserve, catalog and celebrate the terrain of daily life. 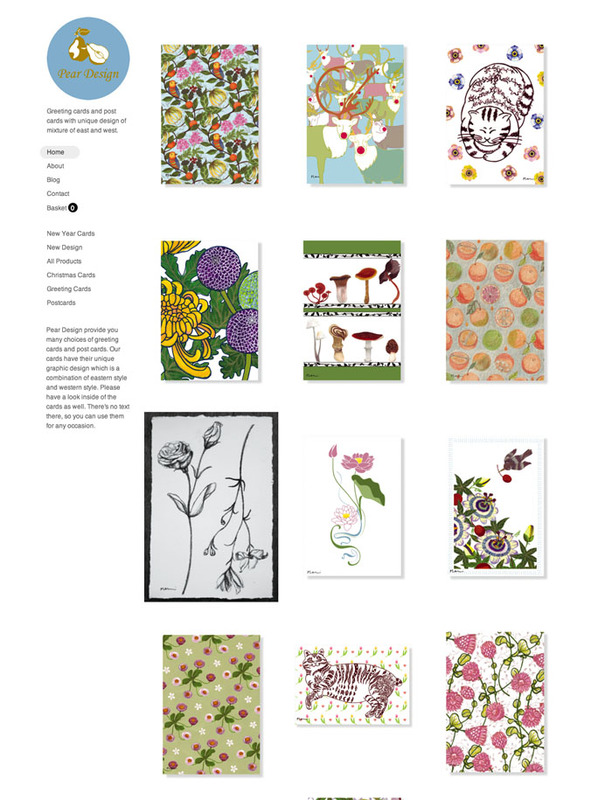 Katherine's simple custom theme chosen for her online store takes a back seat, placing the emphasis on her quirky artwork. Intricate and graphic Myia balances classic style with fashionable substance. Created by award-winning jewellery designer Myia Bonner, the sharp and distinctive designs are handcrafted in her London studio. Myia takes advantage of a simple custom template by using it to draw the eye into her striking designs. 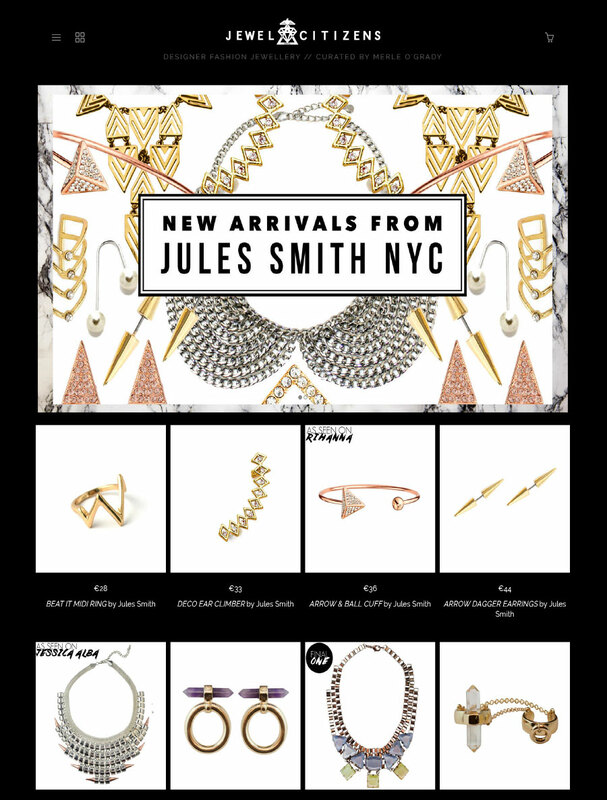 Brooklyn based jewelry designer is putting back the strut in bling. 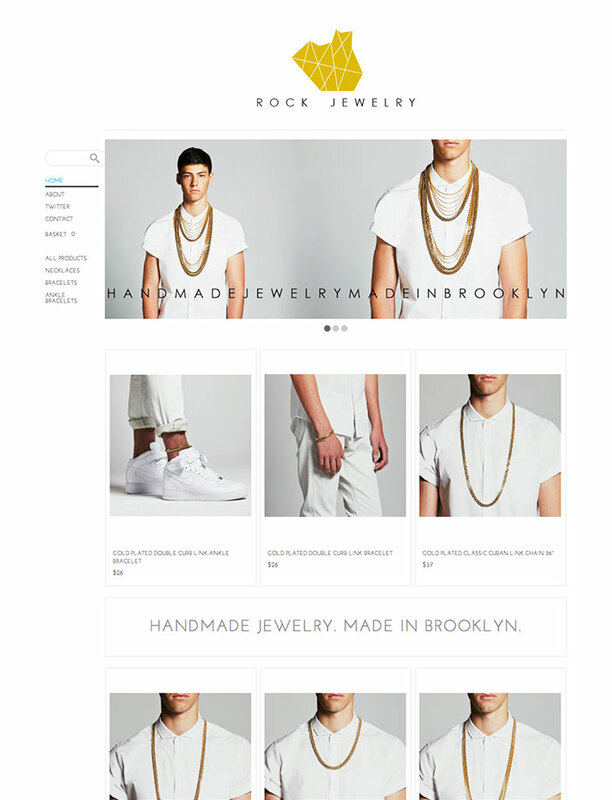 A clean custom ecommerce theme for a no-nonsense product. 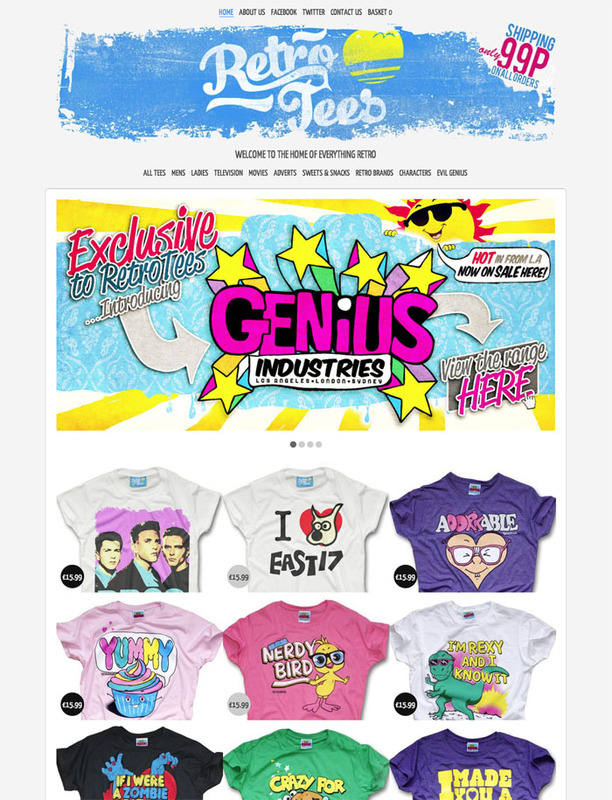 Marz Designs is a young Sydney based design company. Inspired to push the boundaries of many mediums and functions Marz has a quirky and unique style. Marz aims to create timeless and innovative designs, with functionality and quality being their primary focus. The combination of simple branding with the stripped-back custom theme, effectively exhibits these beautiful, functional designs. If you love vintage T-shirts and retro nostalgia then this is the place for you ... TV, films, toys, adverts, tuck-shop treats ... and everything else we loved and thought was cool from those simpler days gone by! These aren't mass produced T-shirts, they are very limited edition rarities ... they really give that authentic 'discovered in a vintage clothing store' look and feel. This simple custom template complements the fun nostalgic retro designs, allowing them to take centre stage. Loglike is a creative partnership, run from rural North Wales by Stephen Bretland and Jen Sandiford, who design, produce, and screenprint gifts, homeware and T-shirts on a cottage industry scale. The beautifully styled product photography has really brought this simple custom template to life. Victo Ngai is a New York based award-winning illustrator from Hong Kong. Her work has received recognition from the New York Times, Communication Arts, American Illustration, Spectrum, SOI NY, SILA, 3X3, Applied Arts and CMYK mag, Digital Artist UK and many more. This custom designed theme gives the homepage a gallery look and feel. The price is revealed only when the images are rolled over so as not to detract from each work of art. 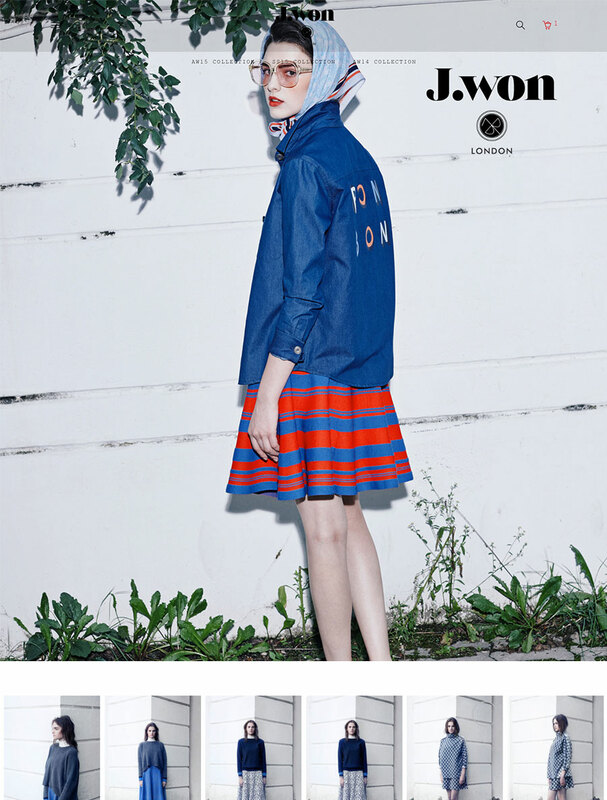 Hokolo is a London based design-led label born in 2012. Jen is the creative engine behind Hokolo. Following a career in architecture, Jen was searching for what she really enjoyed and loved in life; well-designed, carefully crafted, beautiful timeless objects. Showcased on this crisp custom template, Hokolo's bright bold products really stand out. OWL UNDERWEAR - a commitment to fashion and nature, for men who know that natural products made with an organic or a recycled fabric is the basis of a sustainable future. The '4-across' custom theme effectively showcases products that are available in a variety of color-ways. 'Wood Street Mission's Creative Friends, a group of creatives dedicated to galvanising the creative industries to help raise funds and awareness for Manchester based charity Wood Street Mission (www.woodstreetmission.org.uk). 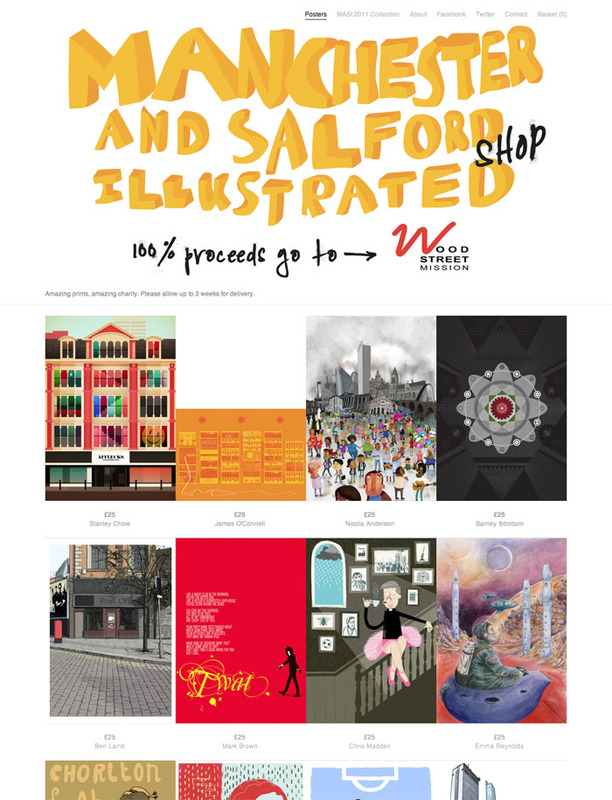 Whilst daydreaming one day one of their number decided to organise a competition to create some wonderful Manchester and Salford inspired images. 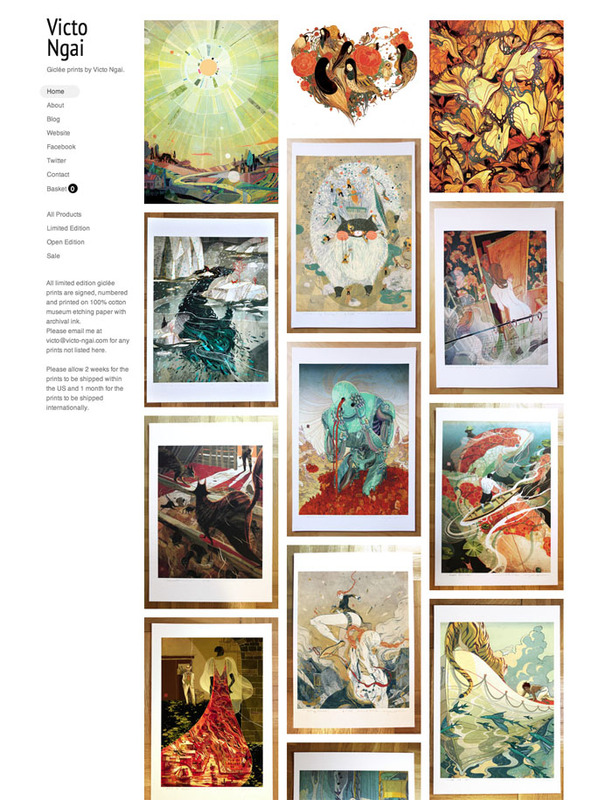 The result is an extravaganza of prints from the winning 30 artists each limited to a short print-run, showcased clearly on a crisp, clean custom theme. t-shirt concept into something more feminine, fun & chic whilst respecting the highest quality standards for my product. Each piece was made in the UK, using 100% luxury cotton, with screen printing illustration. Laura uses a simple monochromatic custom template to showcase her striking black and white product. 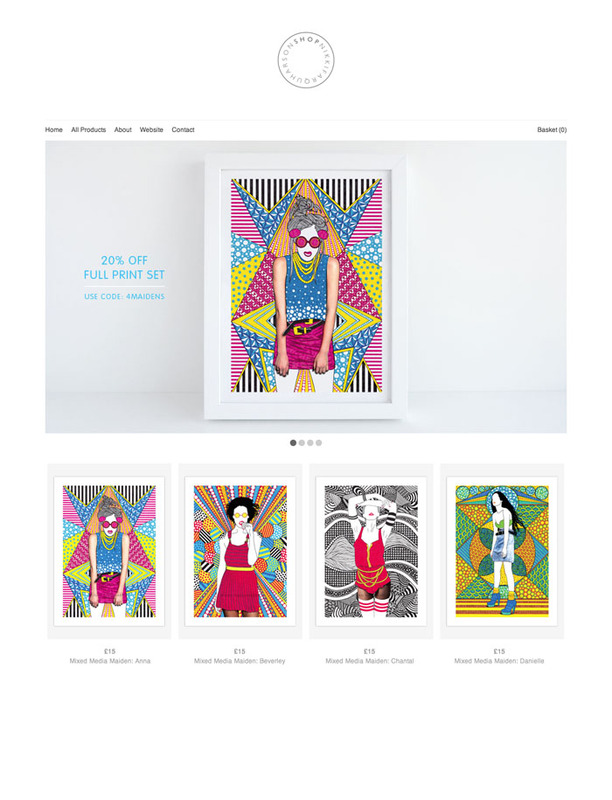 Nikki Farquharson is a London born-and-based freelance creative. Her main goal is to combine her affection for producing work with time and care by hand with her passion for abstract forms and patterned details. 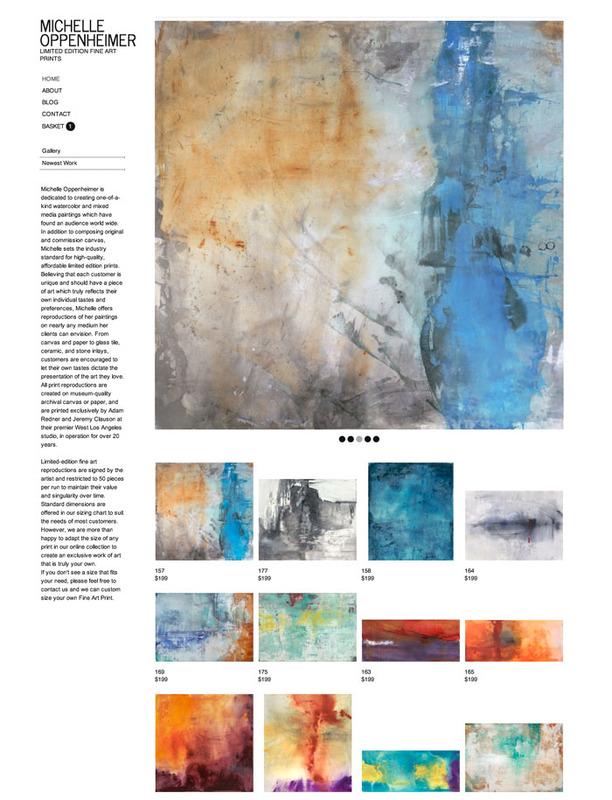 Mixed-media artwork is fast becoming the most predominant feature in her portfolio - a serendipitous style which she plans to continue and develop. Nikki combines this clean custom theme with simple branding to showcase her eye-catching artwork. Amanda Li Hope finds inspiration for her jewellery from the minimalist form, beauty, and detail found in the built environment. Trained as an architect in New York and London, she is a self-taught jeweller whose designs explore simple geometries. All her pieces are made out of silver, gold, and hand selected gemstones. These valuable materials, combined with simple design and fine craftsmanship, make her pieces striking, versatile, and elegant. 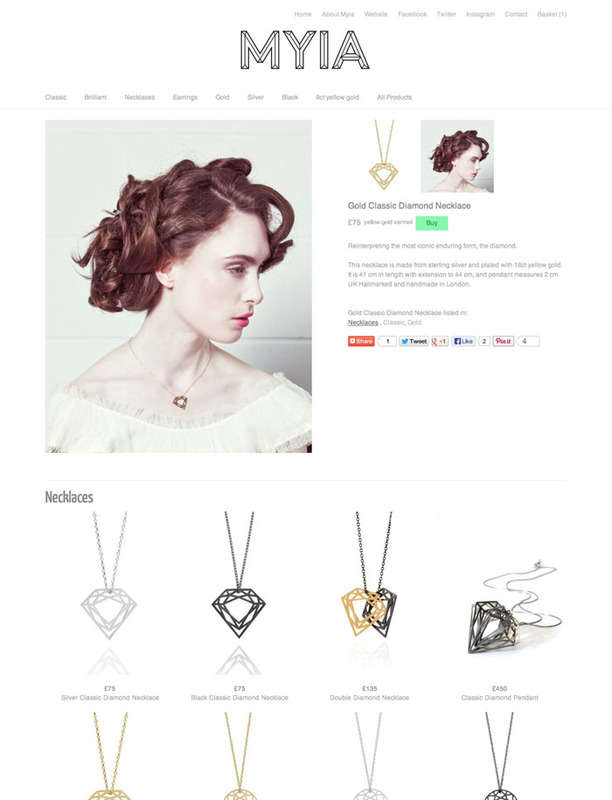 The clean custom theme chosen for Amanda's ecommerce store, reflects this elegance. Amanda designs and makes her jewellery at her studio at Craft Central, Clerkenwell London. This store, McLovebuddy, is named after the owner's dog, Mr. Sal Phan. He got the nickname since he beamed so much affection to everyone. 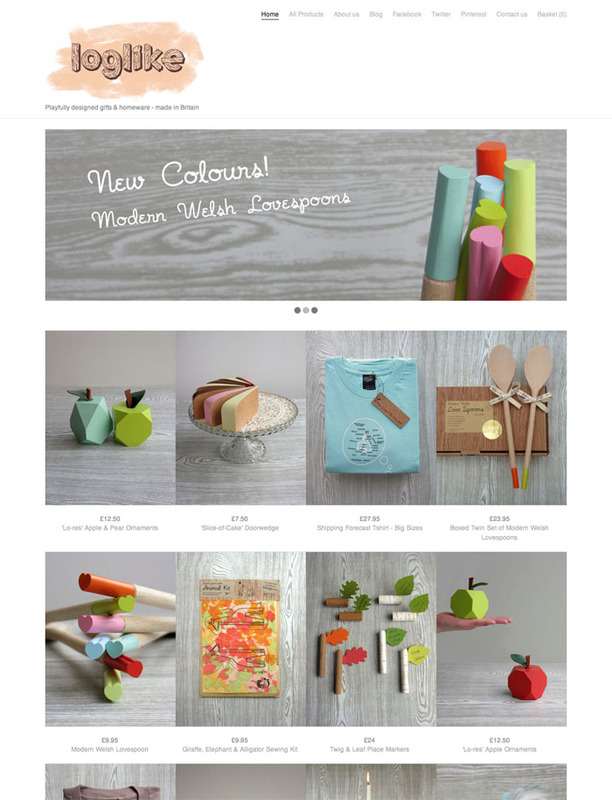 The simplicity of this store's custom template helps to focus the eye on the colourful product. Michelle Oppenheimer is dedicated to creating one-of-a-kind watercolor and mixed media paintings which have found an audience world wide. 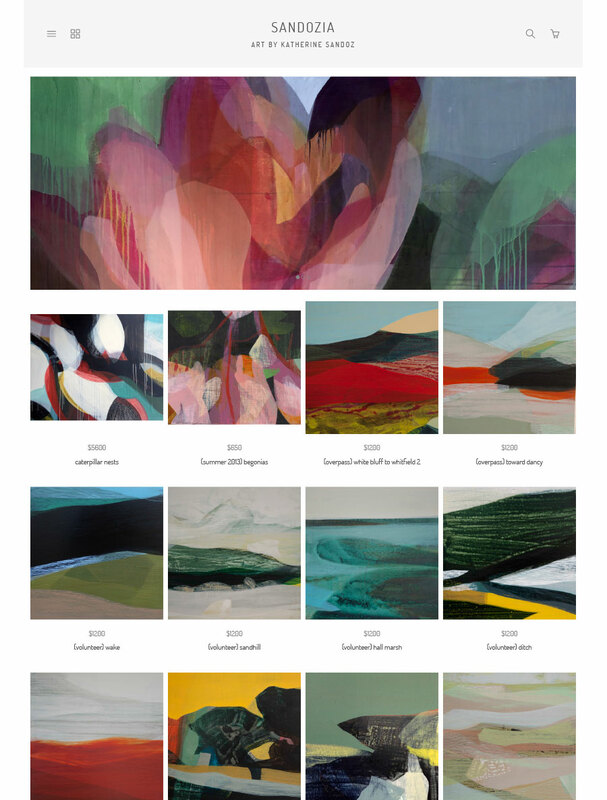 In addition to composing original and commissioned canvases, Michelle sets the industry standard for high-quality, affordable limited edition prints. Michelle takes advantage of the sliding banner in this custom template, to show the detail in her artwork. Narumi Otobe is a graphic designer at Pear Design. Born in Tokyo, Narumi always liked art and design, but never studied them formally. A mixture of traditional Japanese line illustrations and western layouts are a signature of Narumi's greeting cards which are a constantly evolving conversation between these two cultural influences to her work. Narumi has chosen an understated custom template to exhibit her intricate artwork. Contemporary Art With A Freakish Taste! Born in Catanzaro (1962-Italy) where he lives and works, Claudio Parentela is an illustrator, painter, photographer, mail artist, cartoonist, collagist, journalist free lance... Active for many years in the international underground scene. 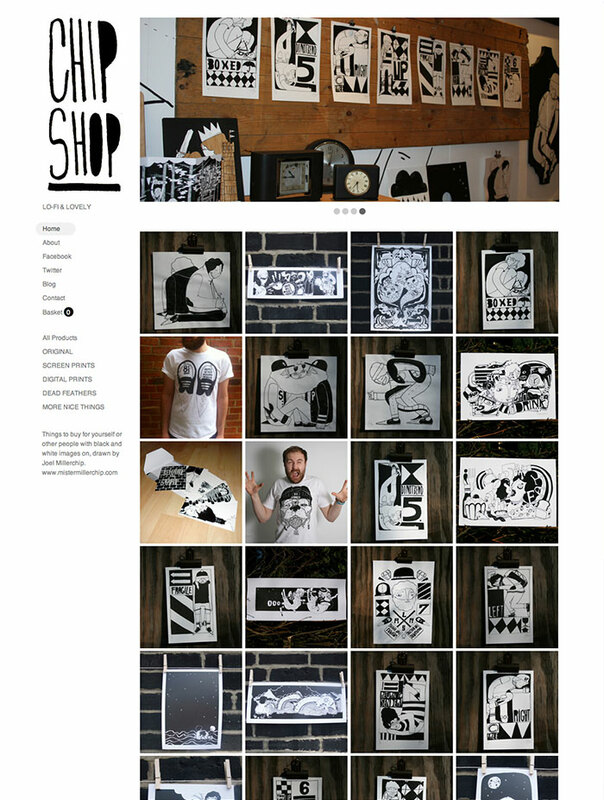 For his ecommerce store, Claudio chooses an uncomplicated custom theme to showcase his work. Little Constructs started off, like most things, as an idea. A conversation on Etsy between Jo Cheung and Erica Williams that sparked a collaborative project that crossed international borders from conception. What would two illustrators from two separate counties going to do as a collaboration? That is where Little Constructs came into being. 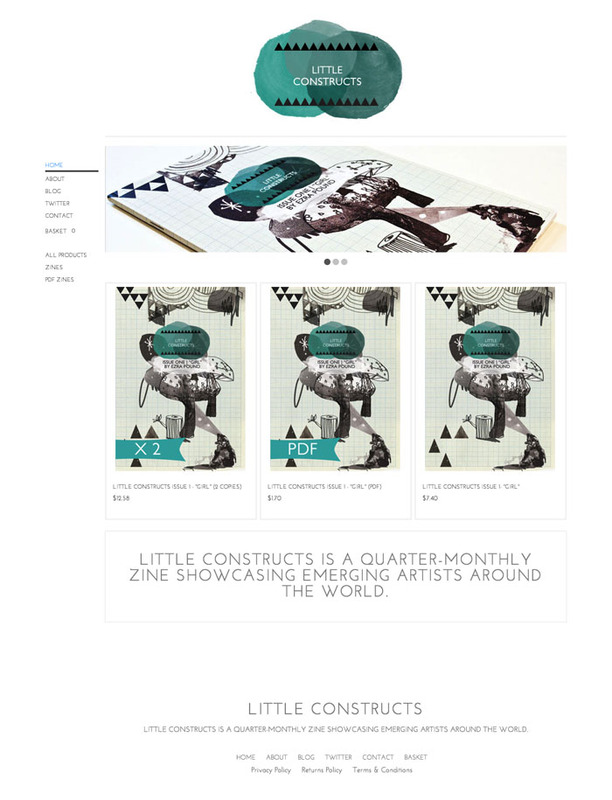 The Little Constructs magazine sits comfortably in this highly organised custom designed theme. 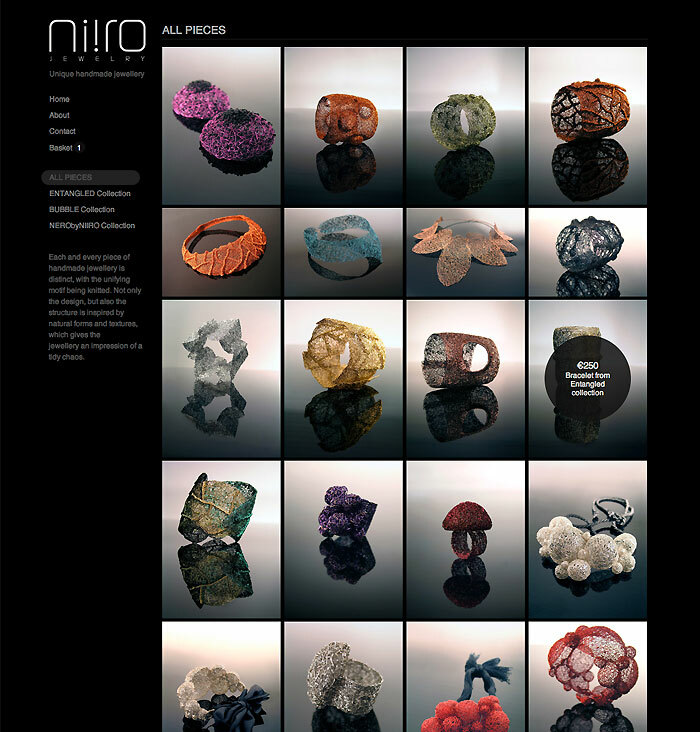 Niiro's every collection of handmade body adornments is marked by the innovativeness of irregularly patterned knitting, sparkling, colourfulness, and genuineness and uniqueness of the material used. Niiro's striking photography stands out against the black background of this custom designed theme. Miscii was created for people who don't take life too seriously. Wearing these quirky, playful little guys will cheer you up and brighten those normal boring days. It's age-proof too (hehe). Anyone can pull it off.... You'll look great no matter what! 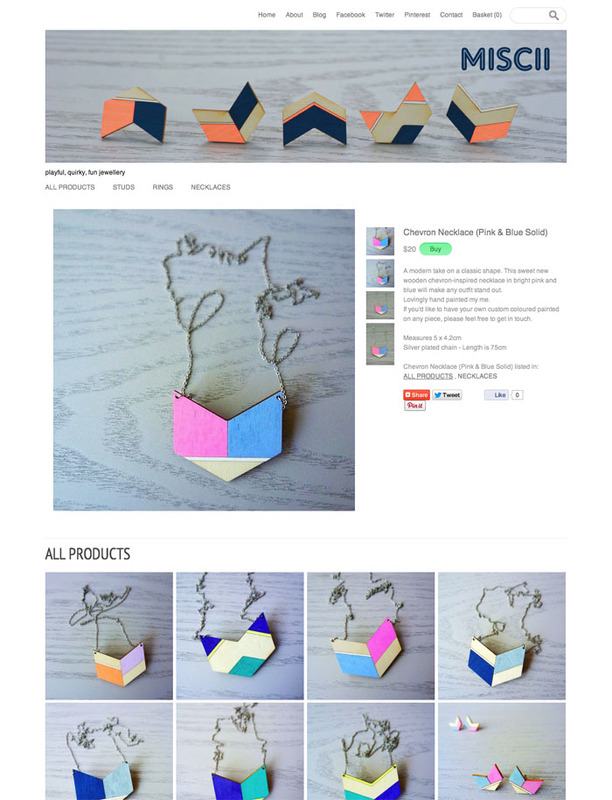 The Miscii ecommerce store showcases funky jewellery. R - Squared is co - founded by two best friends, based in Melbourne, Australia. Concepts of each garment and accessory are contemporary, feminine and laid back with the focus to details. Through the exploration of industry leaders, R - Squared is continually intended to create our own functional, forever wearable and affordable pieces. R - Squared is also a platform for emerging brands and independent individuals to explore simple aesthetics. A shop of products illustrated by Joel Millerchip. Joel is a black and white illustrator based in Suffolk who visually communicates briefs by using curly haired characters, social situations, and story telling. By noting down unusual and mundane aspects of life, Mr M has books and boxes brimming with tales and visual recordings that he uses to inspire Illustrations. 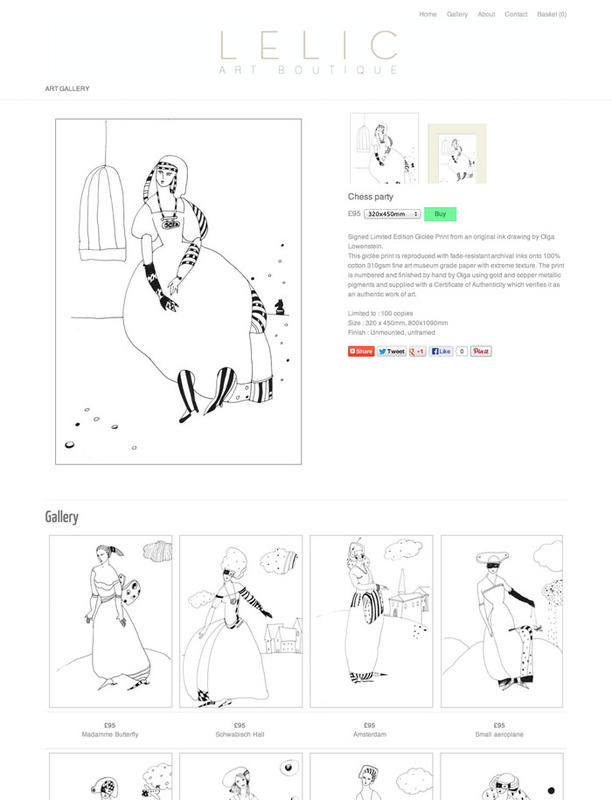 Displayed together, these characters come to life on the homepage of the Chip Shop ecommerce store. Preferring quality and personality over the mass produced, the Brim Label founder/designer/hat maker Emma Cheape, lovingly makes each hat by hand in her London studio. The Brim Label hats are a refined mash-up of unique details, interesting textures, beautiful colour palettes and quality fabrics. These rich textures and colours are emphasised by the simplicity of the store's well designed custom theme. Moquii is a collaboration between the designers Miriam Gradl and Stefan Behnke. 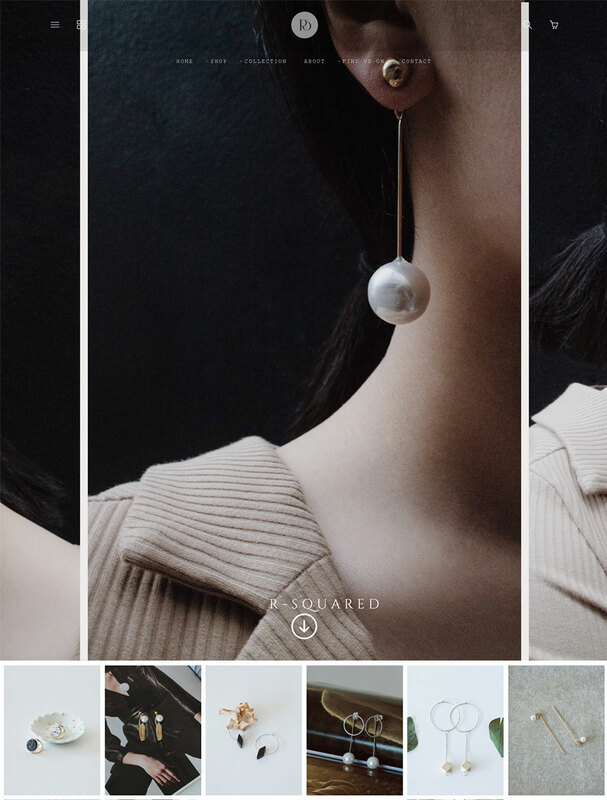 In the Moquii online store the designers created a space for contemporary jewelry in which their own collections as well as other designers' one of a kind pieces and mini series find their place. 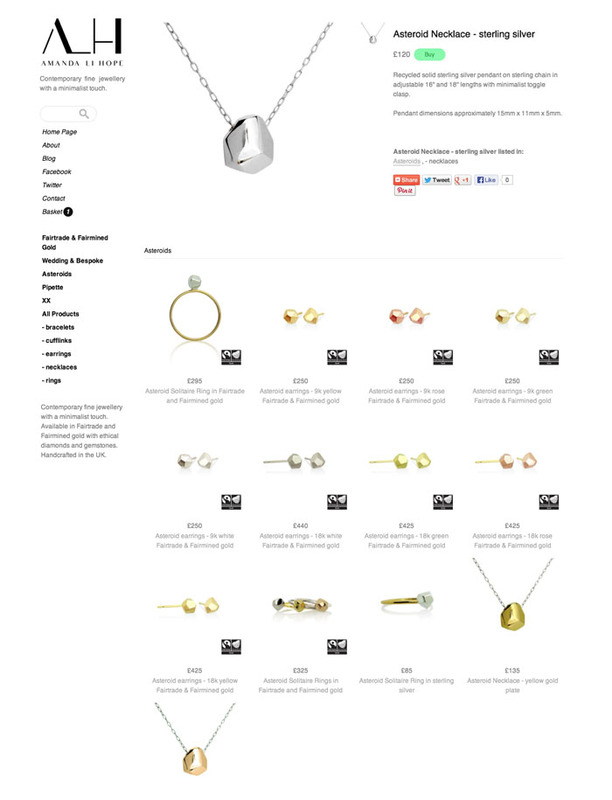 Style Barn's aim is to give you a lovingly curated collection from new & established designers based in & around the UK. Some furniture items are ex-display but in beautiful condition...just in search of a new home….These beautifully photographed colourful home-wares are displayed simply, on a monochromatic custom template. Ros Millar is a young, award-winning designer originally from Northern Ireland. Growing up on the coast of North Down, Ros developed a love and passion for jewellery before going on to study the subject at university. Having graduated in June 2009 and now an established jewellery designer/maker with her own studio in London, she offers beautiful, exciting, and innovative high quality pieces reflecting her own unique vision. Her latest work comprises a range of organically inspired gold and silver jewellery focusing on rings and neckpieces, which are crafted using a combination of, age old and modern methods. This clean custom template complements Ros' organic designs. 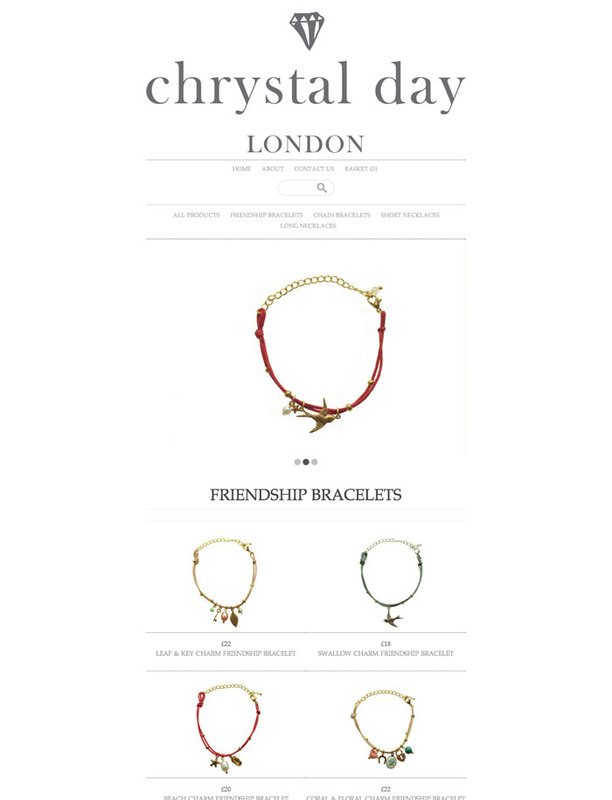 Chrystal Day creates handcrafted and bespoke jewellery, fashioned from a collection of lovingly selected vintage charms, semi-precious gems & beautiful beads - displayed on a simple, clean custom template in her online store. Klements is a printed accessories and fashion label founded by textiles designer charlotte allen. The scarves are made in Italy and the garments are printed and beautifully made in London. 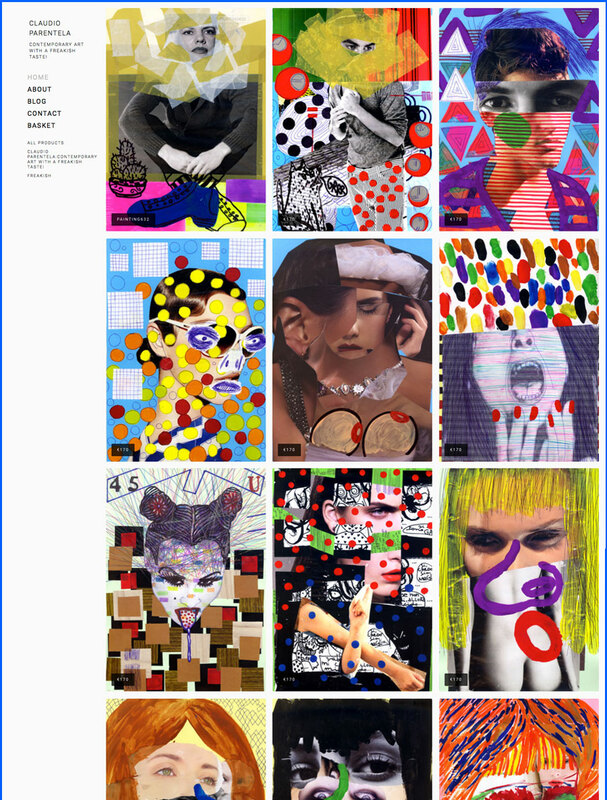 Their distinctive artworks are hand drawn / painted or created from photography. Klements draws inspiration from the natural world; all its glory and cruelty, an innate preference for the macabre, unsettling beauty tempered by a lust for the progressive and acidic. These inspirations are molded by the shifting zeitgeist of the creative scene, especially in London. These utterly beautiful, collectable prints are available on either luxurious scarves or wearable silk garments. 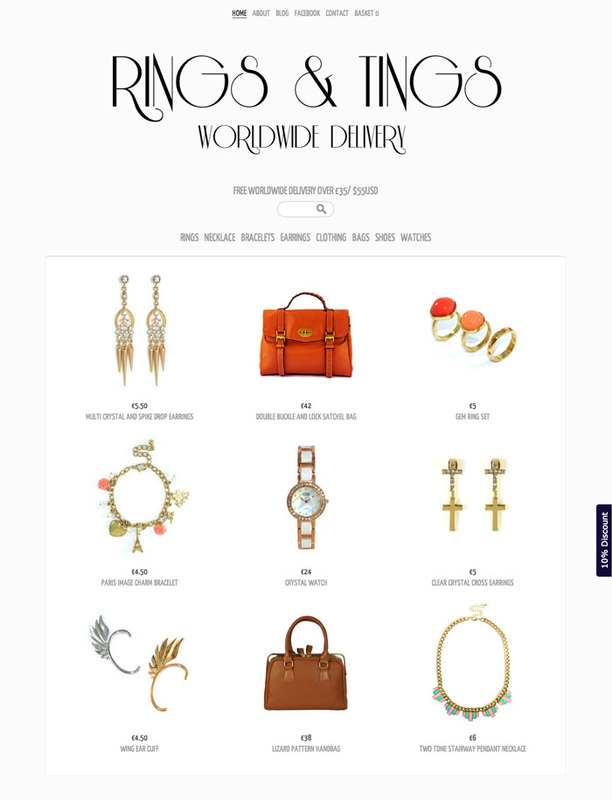 Klements’ ethos is to create exceptional items, to be kept and treasured. Designed carefully with the belief that fashion should not be fast. Dale Edwin Murray is an illustrator/graphic artist. 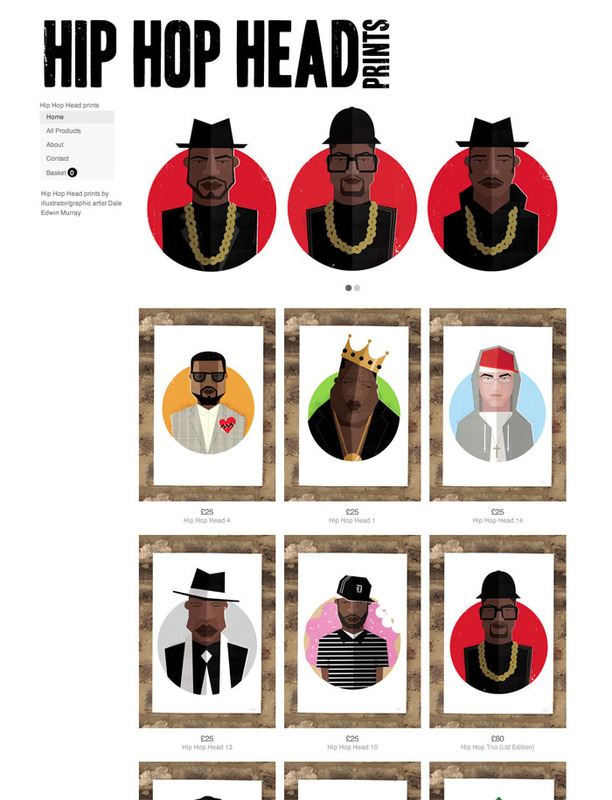 The Hip Hop Heads portrait series started off as a personal project - a way for Dale to practice his caricature skills. It was quickly picked up on by a huge number of blogs and he got a load of emails from people asking if they were available to purchase as prints. They are now available for purchase from dale's online store. Limited edition leggings handmade in Berlin. Extraordinary is their thing that's why they love large, bold prints and as every pattern is cut out individually, each legging is unique. For loite von hoite, leggings must fit perfectly and have to be comfortable when wearing them all day long. Therefore they have dedicated a real amount of time on getting the pattern just right. 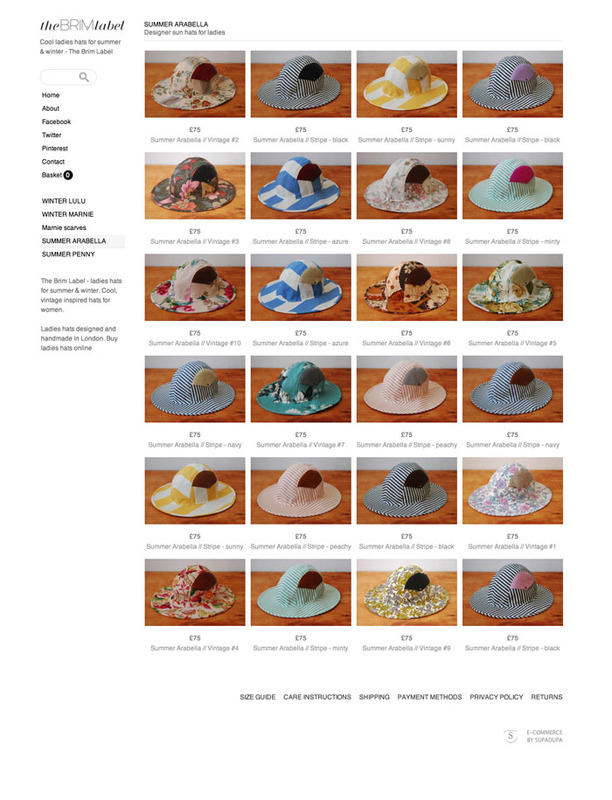 For loite von hoite's online store, a simple custom template has been chosen to showcase the colourful product. 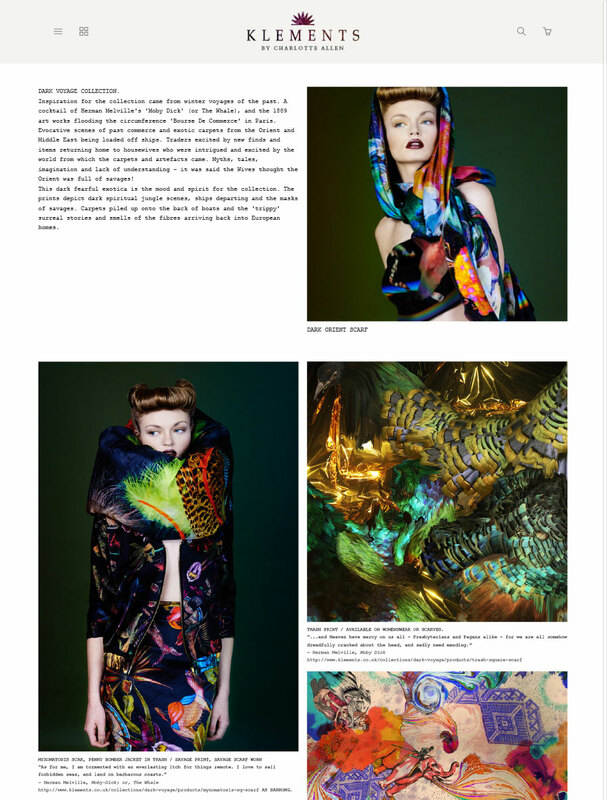 Úna Burke is a London based Luxury Leather Accessories Designer and Artist. Using vegetable tanned bovine leathers and traditional leather-working technique’s, Úna has developed and refined her distinct construction identity of leather panelling, joined with brass fittings. With this she creates seasonal fashion collections and sculptural art pieces - shown during London and Paris Fashion Weeks and now available from Úna's online store. Rings and Tings is an online fashion store stocking unique pieces at a reasonable price. From Jewellery to watches, every detail is important and can add character to an outfit. Rings and Tings will be there to provide that little special treasure that shall be cherished forever. This custom template takes advantage of discount codes. No long term contracts. Cancel at any time.